You're remodeling the bathroom and have dreams of adding some spa like comforts. A garden tub with pulsating jets, luxurious tile and comfortable fixtures come to mind. And maybe even a heated floor. Lots of people are considering radiant-heated floors because of that extra level of spa-like comfort. Before you make a decision about a heated floor, you should know some of the pros and cons of these types of heating systems. Here's a brief run down on the main types of systems and the pros and cons for using this type of heating system. Of course, your local HVAC professional will have more detailed information. 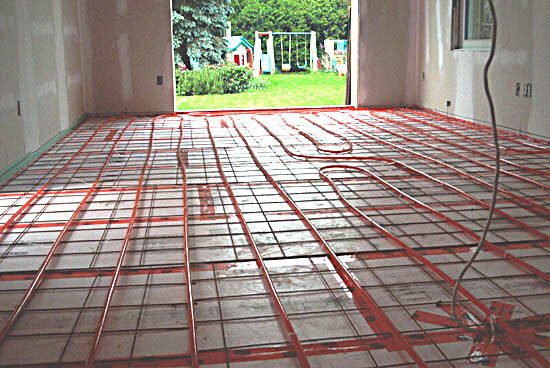 Heating Floor Systems: Which to Choose? There are two main types of radiant-heated floors. The first is electric, which provides heat through electrically heated coils. The second is hydronic, which provides heat through water-filled tubes. The tubes can be heated in a variety of ways using solar power, oil, gas or kerosene. Not sure which to choose? Ask your local HVAC professional for their advice. If you are adding heated floors to the bathrooms or to the whole house, there are some definite positives to radiant-heated flooring. The first of course is comfort. There is nothing like waking up on a cold morning and putting your feet on warm hardwood floors. Radiant-heated floors also take up no extra space. Because this type of flooring is installed underneath the floors, it is completely out of sight except for the thermostat. Usage cost is a pro as well. Users of radiant-heated flooring report about a 15 percent to 30 percent increase in their heating bills, depending on the size flooring they have installed. Contact your local HVAC professional to get a more localized estimate. Durability is also a great factor with radiant heated floors. Protected by two solid layers, these systems were designed to last. And on the plus side, the installation time is fairly short. Allergy sufferers benefit from these systems too! They provide cozy warmth without blowing around a lot of dust. There are a few down sides to adding an electric heated floor. One is the heated floor system can't be retrofitted under your existing floors. Your local HVAC specialist will have to take up the old floor, install the heated system and replace the flooring. Look to spend about $15 to $20 per square foot. Also, you may need new wiring from the main electric circuit panel in order to adequately power your heating system. And lastly, radiant flooring doesn't heat up as quickly as a space heater. You may have to wait for an hour before your floors are warm. You'll find the same positives as you did with the electric system in addition to some fuel-cost savings. Whether you go with solar or oil, these electric alternatives will save you money. Ask your HVAC specialist which system he recommends and why. Add the same cons as the electric counterpart plus one more. While electric systems are durable, with a hydronic heated floor, you have the chance of experiencing water damage. With a significant leak there could be damage to your floors, your furniture and your home. Contact your local HVAC professional for his suggestions on radiant-heated floors. Mimi Bullock is a copywriter for Yodle Local, a business directory [http://local.yodle.com] an online advertising company.